Standing on the stern of the Bainbridge Island ferry, I watched Seattle’s skyline get smaller and smaller until the Space Needle could have been used to darn socks. Just 30 minutes prior, I was caught in the tourist hustle and bustle of Pike Place Market, where my unsuccessful attempt to grab a croissant before departing from Pier 52 left me frustrated and hungry. As we entered the calm waters of Winslow’s Eagle Harbor, I felt a sigh of relief as I welcomed my three days of seclusion where few Seattle natives, let alone tourists, venture. Forget about $500. All you need is $10 to get a reprieve and slow down. Though very much a residential community, Bainbridge Island offers at least two reasons to make the trip across Puget Sound, if even just for a few hours: the view of Seattle and majestic Mount Rainier, and the locally made ice cream. You’ll pay just $6.70 for the round-trip ferry ride and $3.20 for a cone, and can make a day of it. However, you would do yourself good by budgeting for a longer stay. I did, and found some much-needed peace and quiet. No matter how much money or time you have, you’ll be sure to capture a local snapshot of the Pacific Northwest, sans the crowds. Not only does Bainbridge Island have a local feel, but almost everything you see and do there revolves around what’s available nearby, whether it be natural resources, scenic beauty, or Pacific Northwest culture. Because eating is one of easiest ways to sample local flavor, and since I left Seattle ravenous and had food on my mind when I arrived, I’ll start with the island’s bounty of edibles. One of my biggest finds was Mora Iced Creamery in Winslow, which could justify a whole column on its own. Owned by Argentinean natives Jerry Perez and Ana Orselli, this “upscale, Old-World ice cream shop” opened in June 2006 and embodies the best of Bainbridge. According to Ana, “Our philosophy and challenge is to make ice cream as your grandmother would have made it, with real ingredients, no short cuts, no flavorings, no additives, and all the love and passion.” She says that most of the flavors, though always fresh and often local, stem from their culture in Buenos Aires, which has many European influences. Flavors like dulce de leche (literally translated as “milk candy”), moscato wine and walnuts, and goat cheese and fig, are so rich that the ice cream doesn’t rely on high butter fat to taste good. Not only is it less fattening than you’d think, but it forces you to stop and savor every bit. Everything is made right on the island, and as a nod to what’s in season for the summer, I sampled a lavender cone with real flowers for $3.20. It was the perfect complement to my 76-cent lavender sugar cookie that I had purchased from the adjacent Blackbird Bakery, another noteworthy snack spot. When it comes time for a full meal, the recently opened Madoka features Pan-Pacific cuisine, which seems to be all the rage right now in this corner of the U.S. The menu consists of wild seafood, hormone- and antibiotic-free meats, and seasonal produce. Although it’s a bit high-end for the island, it’s still a good value, especially considering the quality of ingredients. For $45.01, I enjoyed an appetizer of spicy tuna roll with green papaya and cilantro ginger vinaigrette, and then the coconut seafood soup entree packed with prawns, mussels, and Alaskan halibut, all paired perfectly with a glass of Seven Hills Riesling. Some Bainbridge eateries go beyond local and strive for all things sustainable. The Island Health Foods Café is close to becoming a zero-waste operation that serves organic cuisine. Despite the food being healthy enough to offset any ice cream overindulgences, you can feel good because what you eat supports regional farmers. Plus, all the containers are bio-compostable so your environmental impact is light. Menu items include flavorful preparations such as a tomato-basil raw pizza in which none of the ingredients have been cooked, not even the crust. I chose the Mediterranean Plate packed with tahini hummus, pine nuts, harissa, olives, tomatoes, and basil, served alongside a whole-wheat pita for $8.69. At Shima, a small organic sushi restaurant with an intimate setting dressed in bamboo and soft lighting, I stuck with my personal favorites, yellowfin nigiri and spicy tuna rolls (yes, these are a minor obsession). I also treated myself to an Asian-influenced fried ice cream dish and a glass of Washington-produced organic Badger Mountain white wine, all for $41.21. The menu refers to “garden sushi,” which I assumed was for the lovely outdoor seating where a few candlelit tables settle among flowers and draping greenery. However, I later realized it had more to do with the restaurant’s homemade vegetarian sushi, a boon for those who either adore seasonal organic produce or who don’t eat meat. If garden sushi isn’t your thing, but flowers are, the New Rose Café at Bainbridge Gardens nursery might be just the thing. For about $8, I picked up a chicken salad sandwich made with onions, celery, walnuts, and currants stuffed into a pita with local organic greens. You can eat lunch or sip an espresso drink on the patio, or bring your items along as you stroll through the grounds and greenhouses. I got lost in the main store building, which sells anything from books on Northwest cottage gardens to French-milled soaps and scented candles. The nursery also promotes “going green” by not selling chemicals and by offering programs to teach consumers about how to garden organically. In keeping with themes of flowers and eco-friendliness, Waterfall Gardens is a self-catering inn set on five acres of organic gardens, woodlands, and spring-fed ponds. After encountering a deer on my way up the driveway, I entered my Waterfall Suite. This 557-square-foot room comes with a sitting area and panoramic windows, a cushy Beautyrest queen bed, and a large bathroom with a shower and a Jacuzzi. I stayed two nights at a rate of $149 per night for two ($164.80 including tax). Breakfast is not included, so I picked up some bread, cheese, and Washington-grown fruits for around $12, which I enjoyed on my private patio while listening to the nearby waterfall and trickling stream. For a truly local experience you can find these food items at the Bainbridge Island Farmer’s Market on Saturdays. If you just want a home away from home, the hiking trails, putt-putt course, and scenery at Waterfall Gardens will keep you occupied for days. Plus, for $25, you can set up a campfire in the woods and create a true hideout. Nonetheless, there are plenty of other ways to commune with the local flora and fauna just a short drive away. Bloedel Reserve, a wildlife sanctuary and former residential estate, sits on 150 acres, about 84 of which are second-growth forest of mostly Northwest evergreens. The rest showcases natural and man-made landscapes featuring native plants, as well as Japanese, reflection, and moss gardens. During tranquil walks in the gardens and woods, you’re likely to spot ducks, swans, great blue herons, and kingfishers, as well as a host of mammals. Plan your visit in advance, as Bloedel requires reservations and limits hourly attendance to “ensure that every visitor has an uncrowded experience.” Admission costs $10. For a picnic or day at the beach, Fay Bainbridge State Park offers a 17-acre marine camping park with pebbled shoreline and basic facilities for cooking. Throw stones in the ocean, go fly-fishing for salmon, or simply gaze at views of Puget Sound and the Cascade Mountains. Though currently under construction, the Bainbridge Island WWII Nikkei Internment and Exclusion Memorial was designed to honor Bainbridge Islanders, the first of thousands of Japanese-Americans who were forced to leave their homes for prison camps during World War II. The setting is natural and serene, and as I explored the Eagledale ferry landing site where the people met their fated departure, I found the early construction of peaceful walkways and the contemplative story wall. Bainbridge Island is fairly expansive, so if you go for longer than a day or want to explore more than the main town of Winslow, I highly recommend bringing a car. To save some money, I rented at a downtown Seattle location instead of at the airport. I paid $133.08 for a last-minute, three-day weekend rental, which would have cost less had I booked more than a few days in advance. 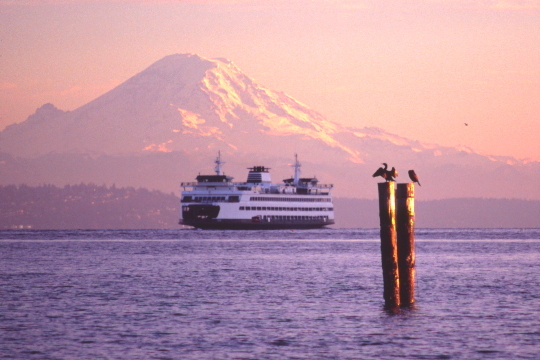 The ferry departs conveniently from Seattle’s Pier 52, and takes about 30 minutes to reach Winslow. Single passengers pay $6.70 round-trip, and cars cost $28.90. Wi-Fi is available onboard, though you likely won’t need it as you fixate on the surrounding views of Puget Sound. When my three-day retreat ended, I stood on the ferry’s bow watching the Seattle skyline get bigger and bigger, while I lamented my departure from Bainbridge Island. One question swirled in my mind: “Could I translate this local Pacific Northwest experience to the big city”? Find out the outcome in my October column as I go on a quest to live and eat local in Seattle for under $500. Meanwhile, be sure to read my September column on Vermont, just in time for the fall foliage season.